It is my very great pleasure to welcome, Caitlin Scarano, the current editor-and-chief of Permafrost to Niche. I want to take this opportunity to thank her again for agreeing to conduct this interview. NICHE: According to the website, Permafrost was founded in 1977. How has the vision and ‘aesthetic,’ for lack of a better word, for the magazine evolved? What do you know of its founding? CAITLIN SCARANO: Permafrost was founded in 1977 by a group of graduate students at University of Alaska Fairbanks. Though there was a faculty advisor, the intention was that the magazine would be student-run, which it remains to this day. I recently learned that three of the founding editors are still in Fairbanks and still writing. When it was founded, Permafrost was the only literary magazine in Alaska, and is still the longest running. There was no founding statement that I’ve come across in my research. In their nature, I think student-run literary magazines or journals are often fragmented historically and aesthetically, because, although there may be well-established initial vision or purpose, the staff is rarely continuous, especially with a magazine as old as ours. This can be a good thing – it makes the vision and aesthetic more mosaic-like. The staff of Permafrost changes every two or three years as students graduate from the University of Alaska MFA Creative Writing program. I believe the tastes and preferences of the Permafrost staff strongly guide its aesthetic at any point, and that staff is constantly changing. For example, one of our genre editors is especially passionate about experimental fiction, so that could be reflected in next winter’s issue. The title of the magazine demonstrates Permafrost’s northern flavor. We publish writing from across the world, not just “Alaska writing,” but we find that landscape, the environment, or the North (however defined) often influence the submissions we receive. I love that about Permafrost; that it does have a distinct personality but that we have the freedom to publish any quality writing. NICHE: On the Poet & Writers Literary Magazine database Permafrost is listed as a print magazine, but it seems like it has an online presence as well. Is this fairly recent? Tell us a little bit about the shift. Will Permafrost now have both an online, and a print edition? If so, what are the benefits and downsides of both? CAITLIN SCARANO: Our online presence is recent! We published our first online issue last summer (Vol. 34.2), and Vol. 35.2, due out this summer, will be an online issue. Readers can watch for it at www.permafrostmag.com. Personally, I am torn on this topic. I believe online publishing is the inevitable way literary journals (if not publishing at large) may be going, but there is still something invaluable about the weight/feel/presence of a book or literary magazine in your hands. While we hope to improve and experiment with the design and layout of our summer online issues, Permafrost will continue to primarily publish a winter print issue indefinitely. 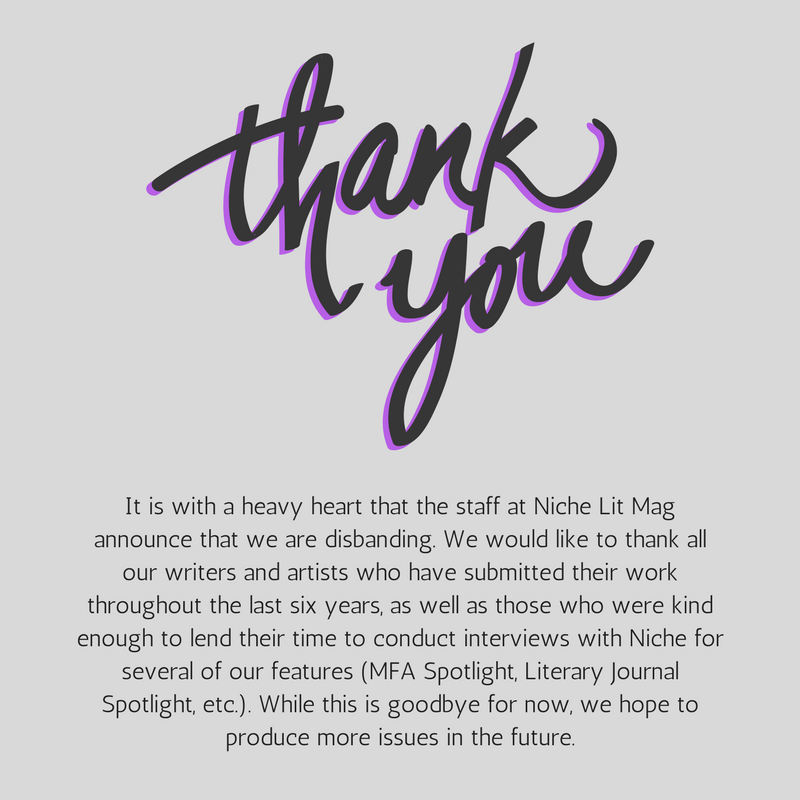 NICHE: Literary magazines seem to run on the promise that contributors will be granted the prestige that comes from being published along side the famous and infamous. Some of Permafrost’s representative authors and artists include Allen Ginsberg, Andy Warhol, Dan Pinkerton, Billy Thrope, and Illy Kaminsky. What other authors of note has the magazine published to date? CAITLIN SCARANO: Great question! We’ve featured writing by or interviews with Naomi Shihab Nye, William Stafford, Robert Boswell, Günter Grass, Amy Bloom, Peggy Shumaker, Camille Dungy, Ed Skoog, and Sean Hill – the list goes on! Vol. 33: Winter 2011 includes a great tribute to John Haines and some of his poetry. Last fall student staff members conducted interviews with poet Robert Wrigley and memoirist Kim Barnes. These interviews can be found in Vol. 35.1: Winter 2013. I think it is important for a literary magazine to publish and promote “big names” because their work is clearly deserving, and it draws attention to the magazine. But I see Permafrost mainly as a venue for new writers, as often is the case for student-run MFA literary magazines. Personally, I’m most interested in helping these writers, who may just be starting to submit and publish, find an audience. But if Sharon Olds wants to publish some poems with us, obviously I wouldn’t object! NICHE: What role do the graduate students of The University of Alaska at Fairbanks play in the production? Do they accept and reject submissions as well as read? Can you tell us a little about how the selection and the designing process is handled? CAITLIN SCARANO: Besides the guidance, input, and fundraising efforts of our awesome faculty advisor, Daryl Farmer, graduate students are the magazine. Our staff is comprised of the Editor-in-Chief (myself), Managing Editor (Caitlin Woolley), Web and Design Editor, as well as genre editors in art, poetry, fiction, and nonfiction. We also have a group of 10-20 graduate student readers. Each submission is read by at least three students, and each reader gives each submission a “Yes,” “No,” or “Maybe” response in regards to publication. The genre editors handle the rejections. Any submission that receives a “Yes” or “Maybe” response is reread by the Editor-in-Chief and Managing Editor, who handle the acceptances. Communicating with writers and letting them know that their work has found a home with us is one of the most rewarding aspects of my position. NICHE: Roughly how many contributors does Permafrost publish each issue? How many of those are unsolicited? And roughly how many submissions does the magazine receive each period? CAITLIN SCARANO: We’re trying to raise the quality and length of the magazine overall. Vol. 35.1: Winter 2013 featured over 50 contributors. The page count was 216, which is nearly double the page count of last year’s winter issue. We usually don’t solicit work accept for art, because we receive a very small pool of artwork. I think this is a common issue for literary magazines. In a typical reading period (based on the reading period for Volume 35.1), we receive around 300 submissions. Currently, we accept both snail mail and online submissions (via Submittable.com). NICHE: It seems that Permafrost is currently open for submissions until the end of March, is that correct? When will readers expect to see the next issue? CAITLIN SCARANO: Our submission period for Vol. 35.2: Summer 2013 online issue just closed, but submissions for Vol. 36.1: Winter 2014 print issue (due out in March 2014) will reopen from September 1st – December 15th, 2013. NICHE: I’ve learned that most literary magazines basically rely on someone’s labor of love. Is Permafrost self-sustaining? CAITLIN SCARANO: Isn’t that the truth! I know for me, and our staff, Permafrost is a labor of love. The magazine is volunteer-run, and published through fundraising and the cost of our reading fee through Submittables.com. But, as you probably know, we do this because getting people’s work out there in the world is valuable and meaningful. NICHE: Will Permafrost be attending AWP this year? NICHE: What else about Permafrost would you like readers to know? CAITLIN SCARANO: Most of our submissions are mainly poetry and fiction. We would love to see more quality nonfiction and artwork submissions! Issues and subscriptions can be ordered via email (editor@permafrostmag.com) or through our website and Submittables. I really do believe Permafrost is up-and-coming in the literary world and meant for big things, so keep an eye on us! This Journal Spotlight was originally published on Niche’s website on July 2, 2013.